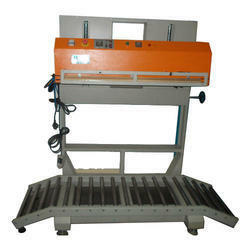 We are offering wide range of Pneumatic Sealing Machine for Pharmaceutical. 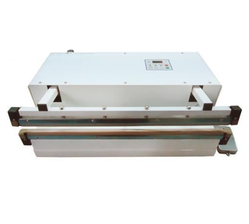 The sealing machine offered by is given in different dimensions and other related stipulations accordingly with the requirement of patrons. Besides this, our clients can avail it from us in different specifications at market leading prices with no constraint. 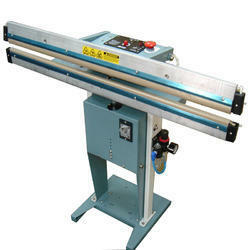 Dimension 51" x 40" x 24"
This machine is useful for high speed Taping / Sealing of Cartons, from Top & Bottom both together. Therefore it has a double motor drive, for simultaneous box sealing from top/bottom. 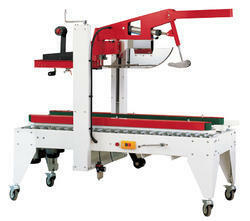 The machine is equipped with Rollers, for smooth movement of boxes. Up down movement of the sealing assembly is by manual hand rotary crank. Different Box sizes can be easily accommodated. The box to be sealed is put on the in-feed rollers & given a gentle push, when the motorized conveyor takes over & starts pulling the carton forward. Here the top & bottom tape dispensers stick the BOPP type self adhesive tape onto the Top & Bottom flaps of the cartons simultaneously along with rollers pressing the tape for a tight seal. When the taping is over, the cutter blades cut-off the tape & the sealed cartons pass through to the out-feed rollers for delivery. After the sealed box is discharged, it is ready for the next box. Also you can adjust the height and width for different cartons very easily. Looking for Pneumatic Sealing Sealer ?